An inspirational, upbeat collection of relatable lessons from the teen sensation, Mackenzie Ziegler - an award-winning dancer, singer/songwriter and actress. Growing up is hard, but growing up in the spotlight is even harder. However, Mackenzie Ziegler is taking it all in stride, thanks to her positive attitude on life. From getting her start on Dance Moms, to her sold-out tour alongside Johnny Orlando, there's nothing that she can't do. 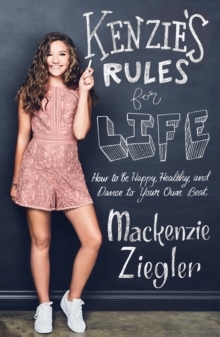 In Kenzie's Rules for Life, the dance prodigy, singer/songwriter, actress and model offers her advice on friendship, family, fitness, style and positivity. For anyone who enjoyed her sister's Sunday Times bestselling book The Maddie Diaries, this will be the perfect accompaniment. She shares lessons drawn from her own experiences for those navigating through their tween years on how to be happy, healthy and confident in all aspects of their lives.